No one knows how this dish got its name; however, it is considered the ultimate French dish in this country. After all, it uses all the most expensive ingredients together — done well it is splendid especially when served with a great French wine. Trim off all the fat and silver skin from the tenderloin, tie it with string about every inch. Save the meat trimmings for another use. Rub the meat with olive oil, sprinkle with salt and pepper, and roast in upper third of a 450 degree oven for 30 minutes. Remove and let cool at least 20 minutes. Remove strings and pour the pan juices into a saucepan. In the meantime, saute the shallots in the butter. Add the mushrooms and cook, stirring, until the moisture evaporates, about 8 minutes. Pour in 1/2 cup of the Madeira and boil rapidly until the liquid has almost entirely reduced. Season with salt and pepper and stir in the foie gras. Let cool 10 minutes or longer. When ready to assemble, cover the meat with the mushroom mixture. 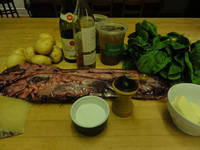 Roll out the puff pastry in a sheet large enough to enclose the filet. Cut 8 or 12 1/4-inch strips from the edges of the pastry. Carefully wrap the meat in the pastry, overlapping and pressing all the seams together firmly. Put the wrapped filet, seam side down, on a wet baking sheet. Brush the pastry with the egg yolk beaten with the cream. Arrange the pastry strips diagonally on the roast. Brush again with the egg glaze. Chill if possible. Put any remaining mushrooms into the saucepan with the pan juices. Bake the Beef Wellington in the lower middle level of a 450 degree oven for 30 to 40 minutes, or until the internal temp. reaches 125 degrees on a thermometer. Remove from the oven and let sit 10 to 15 minutes before carving. Transfer to a heated platter, surrounded with cooked green vegetables or decorate with watercress or parsley. To the reserved pan juices and mushrooms, stir in the remaining Madeira, simmer 5 minutes. Add the stock, and continue simmering. Stir in as much arrowroot mixed with cold water until the desired consistency is reached. Add salt and pepper to taste.